I have been conducting blind Trek for the vVisually Impaired since last year and each time I organize a trek it is a different experience that comes out of it. The enthusiasm of the Visually Impaired and to see the volunteers take the zeal to guide them is a beautiful feel all in all. 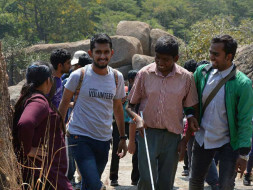 Blind Trek is one of those initiatives which aims at building the confidence of Visually Impaired in mobility and building their social circle. Each batch of Visually Impaired have a different experience and want to go for a trek again. The funds are raised by the crowd cause we believe that we are a community who collectively wants to give back to society.